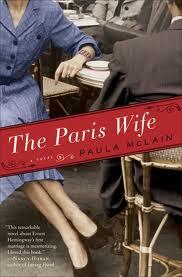 My local book club met this morning for brunch and our discussion of Paula McLain’s ‘The Paris Wife. The brunch (at Pipa’s) was delicious. The book was …. well, dreadful is probably too strong a word, but generally deprecated as bland, lifeless, and devoid of both art and ideas. Some of the group felt it was wholly insincere as well, a marketing ploy meant to catch readers who (like us) think a personal perspective on the whole 1920s Paris literary scene sounds pretty interesting. And in fact that whole scene is interesting, and so almost in spite of itself the novel is too, because Pound and Hemingway and Gertrude Stein and Scott and Zelda and Paris and bullfights are all interesting. What we all found so disappointing is how little the author did with this material. There’s no reflection in the novel, no engagement with the literary passion and experimentation these writers represent–there’s certainly no stylistic flair or experimentation on McLain’s part, no sense of an idea behind the book beyond putting in everything the author had found in her sources. Hadley’s voice is so pedestrian that after a while I thought I could understand why any writer would eventually divorce her: who would want to listen to her? There’s so little substance to her character, too (could this have been true of her in real life? )–she has no focus, no ambition, no sense of purpose, and no insight into the strange and intellectually demanding world of the writers around her. But Hemingway too is flattened out so that his overbearing, charismatic personality (for which he is at least as famous as for his writing) has to be taken on faith, as it can’t be discerned from the narration. The only break from Hadley’s “and then, and then, and then” recounting of people and events is the occasional small section from Hemingway’s point of view, but these seem so disconnected from Hadley’s commentary that some of us suspected they were added in belatedly, perhaps at the suggestion of an editor thinking they would add a desirable whiff of literariness. These judgments sound harsh, and in fairness I should add that everyone agreed a novel from this point of view was a potentially rich concept, that some scenes were effective, or at least believable, and that the author had obviously done a lot of homework. That’s really not much to say on the novel’s behalf, but it’s all we could come up with. Oh, and we thought it would make a pretty good movie, because, again, the milieu and characters have intrinsic interest, the setting could be better conveyed on screen than it was in the novel, and there’s nothing of formal significance to be lost in the translation from one medium to another (unlike, say, Wolf Hall, where capturing the novel’s unique treatment of point of view seems like it would be a genuine challenge for a director and a real loss if it were simply ignored). In keeping with our plan to follow a link from one book to the next–but also because we are feeling soured on new releases festooned with hype–we have chosen Ford Madox Ford’s The Good Soldier for our next book. Isn’t Hadley’s inability to react to all that was happening around her in Paris part of the whole point of the book? My book group certainly thought so. She was an inexperienced, immature girl from the Midwest who couldn’t think beyond the norms she had grown up with. Our group talked over versions of that defense, but overall we didn’t feel that the novel somehow, somewhere, has a smarter point of view than Hadley’s. I agree that the limitations she reflects are consistent with that description of her upbringing and so on–but if the point of the novel really was to show how limited and dull and shallow (and prone to cliches and bad writing) such a person would be, it’s a risky strategy, especially if it succeeds in making the book limited, dull, shallow, and cliched, which is how we found it. Irony at her expense, or some careful development of unreliability in her narration, would have made it a much more interesting book. Your group’s reading strikes me as charitable!